I think that weddings are exceptionally bad preparation for a road race. As my sister will probably only get married once or twice I thought it was a good idea to enjoy it. I survived the wedding relatively unscathed, unfortunately there was a wedding day plus 1. I think that gin is the best drink for runners. I asked the guy who won the 5k down the marina last week how he got so good. He said he stopped drinking pints and started drinking gin and tonic on nights out. This made sense so I drank nothing but gin and tonic for the wedding day plus 1. I definitely didn't put on weight. I think I recovered quite well from the wedding. I had no hangover on Monday thanks to the gin but my head felt like there was a Frenchman living in it. It was extremely unproductive and constantly thinking about holidays. I don't think it was a good idea to do 6x400m on the track on Tuesday. I know it was hot but I was sweating a lot. It was great to have Robert Heffernan jump in in the middle of our session. He made all of us look like fantastic runners with his horrendous running technique. I think he's forgotten how to run. I don't think it'll take him long to remember. 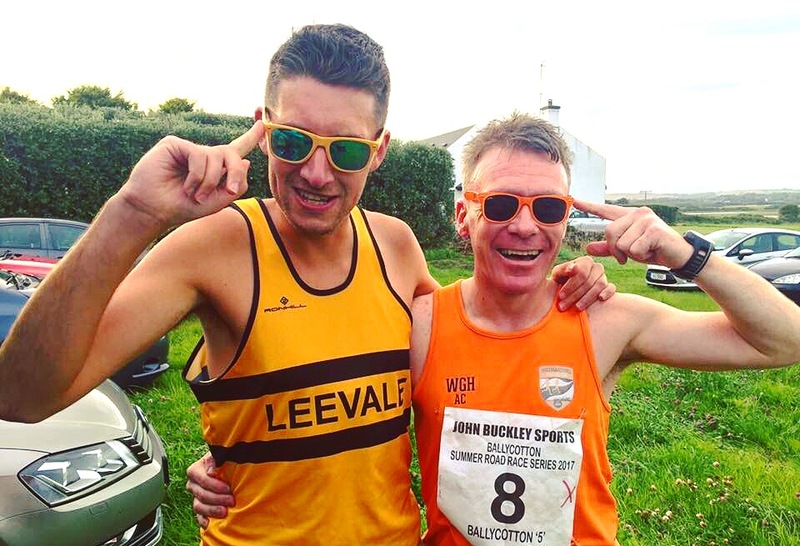 I think it was a shame that Bryan Crowley was too vain not to wear the lovely orange shades that Claire O'Brien gave him. I think he was afraid that they didn't match his hair. He was probably right. I think I'll have to stop running the first mile as hard as I can in every race. It's just so tempting when the photos look so fantastic on Instagram. Unfortunately even with my madness I wasn't able to get ahead of Alan O'Shea, by god he's fast. This made my whole race pointless. I think I was utterly insane to think that I could beat Mark Walsh tonight. I thought it was possible based on sessions but I was very wrong. It was a pathetic effort. I failed miserably. He does have a few advantages in that his father was an Olympian. My father worked in Dairygold. I think that Donal Coffey only beat me because of that hill at three miles. I was very far ahead of him at the base of the monstrous hill because I'm a much faster runner. Hills don't suit me so he was able to close the gap on the vicious climb. I think he's so good at hills because he's from Millstreet. Once he saw that I was suffering majorly on the climb he cruelly tried to crush me, this wasn't very nice. On this occasion he was successful. I tried as hard as I could to catch him but I couldn't as he had an accomplice in Vivian Foley who also gets great pleasure in beating me. It was all very unfair. I definitely would have beaten him if the race was flat and I didn't have that wedding. I think that kid shouting at people at the finish has the right mindset. "At least you didn't come last". I'd love to know what he shouted at the guy who was last. I think the prizes for the race were quite apt. Our team prize was three sets of door mats. I felt like a door mat after that race as Donal Coffey literally walked all over me. I will get revenge.